"An heroic and tragic story from a more innocent, less cynical era--when Irish Americans fought and died, not for profits and plunder, but for Irish democracy and freedom from the world's most powerful empire." Just over a year after Robert E. Lee relinquished his sword, a band of Union and Confederate veterans dusted off their guns. But these former foes had no intention of reigniting the Civil War. 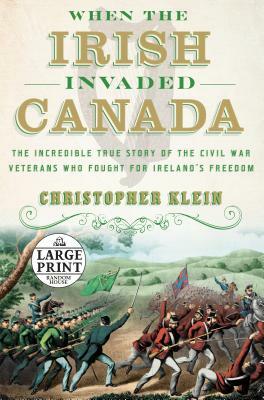 Instead, they fought side by side to undertake one of the most fantastical missions in military history: to seize the British province of Canada and to hold it hostage until the independence of Ireland was secured. By the time that these invasions--known collectively as the Fenian raids--began in 1866, Ireland had been Britain's unwilling colony for seven hundred years. Thousands of Civil War veterans who had fled to the United States rather than perish in the wake of the Great Hunger still considered themselves Irishmen first, Americans second. With the tacit support of the U.S. government and inspired by a previous generation of successful American revolutionaries, the group that carried out a series of five attacks on Canada--the Fenian Brotherhood--established a state in exile, planned prison breaks, weathered infighting, stockpiled weapons, and assassinated enemies. Defiantly, this motley group, including a one-armed war hero, an English spy infiltrating rebel forces, and a radical who staged his own funeral, managed to seize a piece of Canada--if only for three days. CHRISTOPHER KLEIN is the author of four books, including Strong Boy: The Life and Times of John L. Sullivan, America's First Sports Hero. A frequent contributor to History.com, Christopher has also written for The Boston Globe, The New York Times, National Geographic Traveler, Harvard Magazine, Smithsonian.com, and AmericanHeritage.com. He lives in Andover, Massachusetts. "Klein tells the stirring story of a poor but passionate group of American immigrants who fought not only for their new country—on both sides of the Civil War—but for the one they had left behind. It’s astonishing that these men have been forgotten, but Klein brings them back to vibrant life." "Christopher Klein brings to life an almost unbelievable--and yet completely forgotten--episode from post-Civil War America. If you're wondering why the Irish would invade Canada, the answers are here in this exciting, well-told narrative filled with colorful characters."